Zebra Danios grow up fast! Everything about a Zebra Danio is fast. Try to catch them in a big tank and you’ll see. The weather got chilly last week (nights were under 50F) so I decided to get the remaining Zebra Danios out of my turtle pond. I had put about 100 babies out there less than 2 months ago. The babies were about 1/4 inch long at the time. They seemed to do well at first, then I could see the population declining. I was able to catch about 30 with a dip net but the rest were too fast and too smart. They would seemingly disappear! Just vanish! I thought there were maybe 25 or so left. Look who else I found! 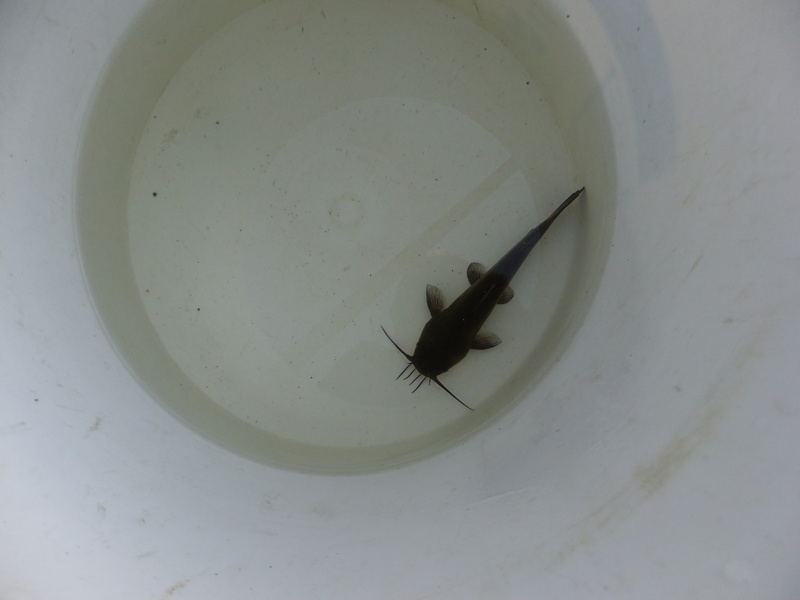 The Bullhead Catfish. I haven’t seen him in so long I thought he was a goner. I bet he snarfed a few Zebra Danios. Here’s a picture of about half of the total number of Zebras that were removed from the pond. From a starting number of about 100 I am just guessing that 70 survived. Here they are in a 10-gallon aquarium. Teenage Zebra Danios about 3 months old. 25 of them are in other tanks, plus I gave a dozen to a friend, so the total was easily over 70 and that’s not too bad. I put these Zebra Danio fry into the pond about a month ago. I fed them every few days with some finely ground dry food. Mrs. D, these are the babies of your Zebra Danios, so please take as many as you can. Pick a number between one and a hundred! The latest batch of Silver Angels became free-swimming today, so I cleaned out the 30 gallon pond a little bit. I want to leave it natural, with all the little micro-organisms for the baby fish to eat. Tomorrow morning, while it is a decent temperature, I will put the baby Angels outdoors. I had baby Zebra Danios in the pond, and I took them out today. My next post will show them. A lot of eggs did become white with fungus,but about 50 babies hatched. 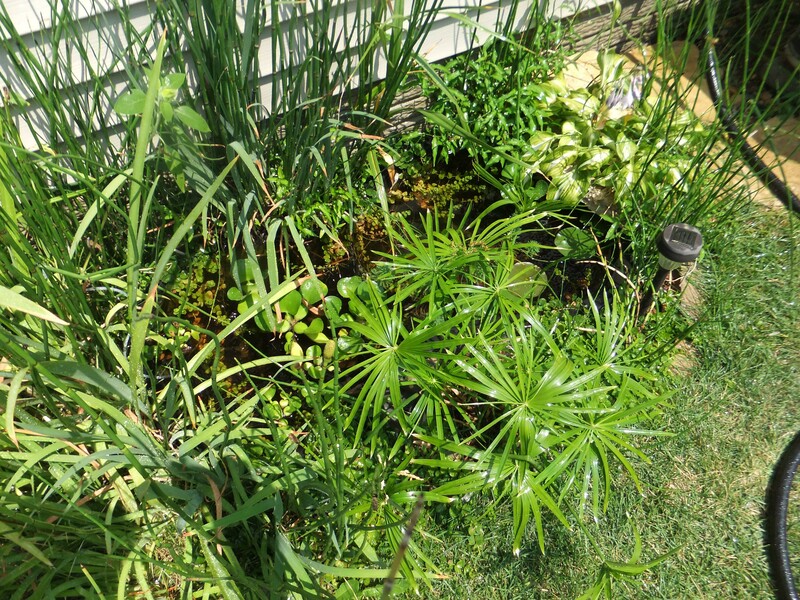 The plants in the little pond are doing great. I took out the Zebra Danios, changed about half of the water, put the plants back in, and will add the Angels tomorrow. It’s the lazy man’s way of raising fish fry. Let Mother Nature do it. I have mentioned this before but as the year goes by it seems even more evident. 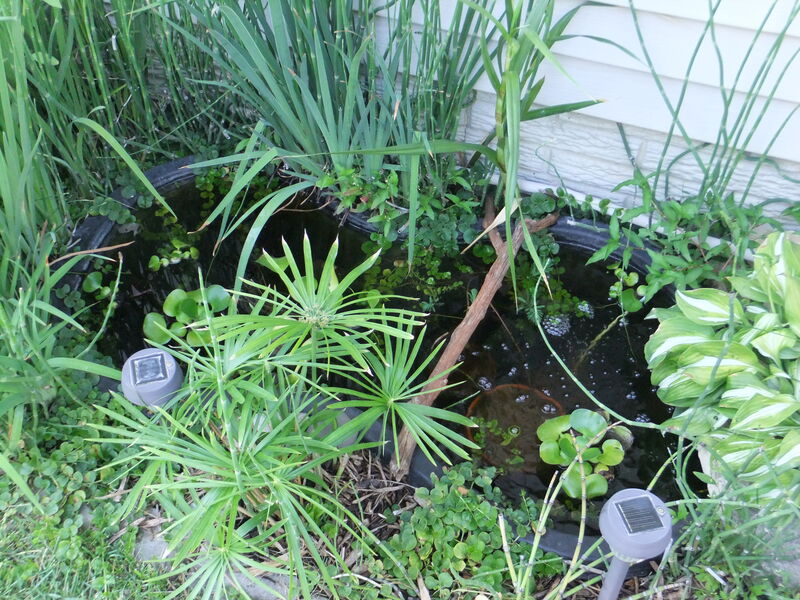 Having plants in an outdoor pond keeps the water much clearer and healthier. 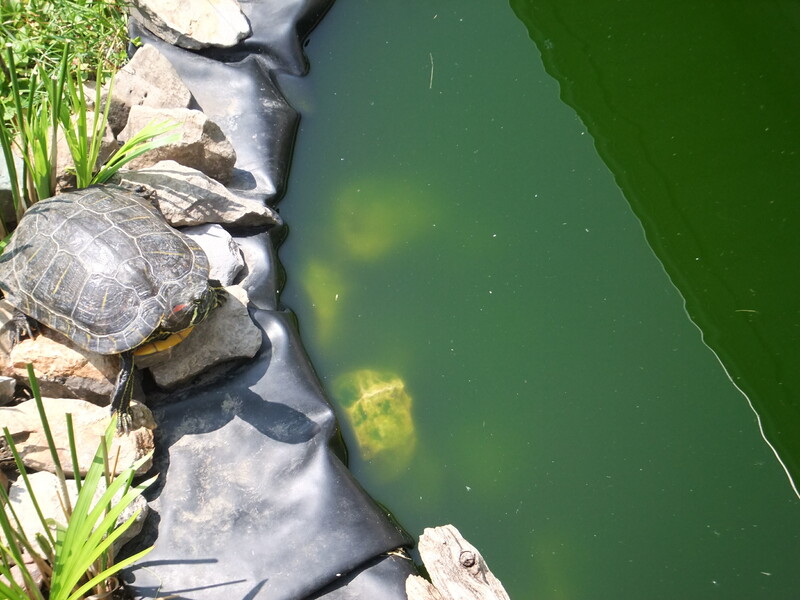 In my big pond the turtles would eat any aquatic vegetation so the water becomes green with algae. 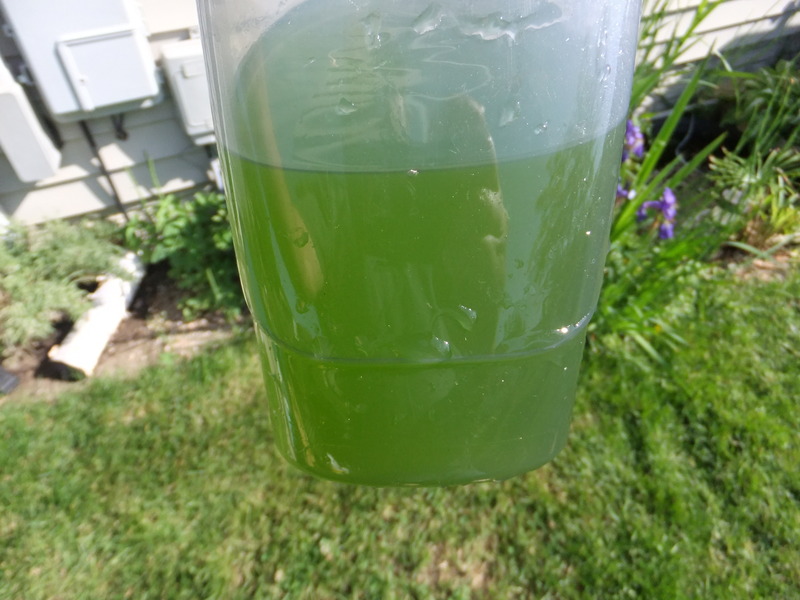 I have a 500 gallon-per-hour (GPH) pump running on the pond but the filter won’t take out such small particles of algae. 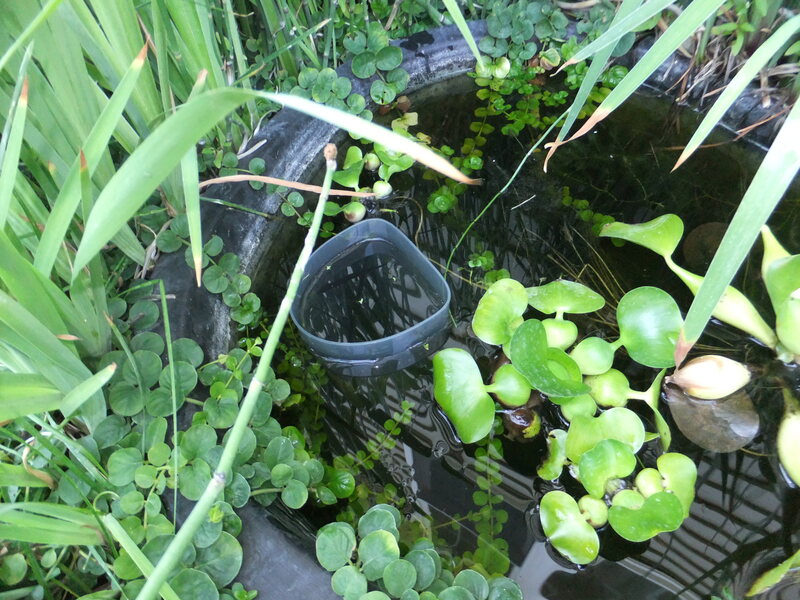 In the little 30-gallon pond, all I have for filtration is a sponge filter connected to a small air pump. There are about 40 little Zebra Danios in there. 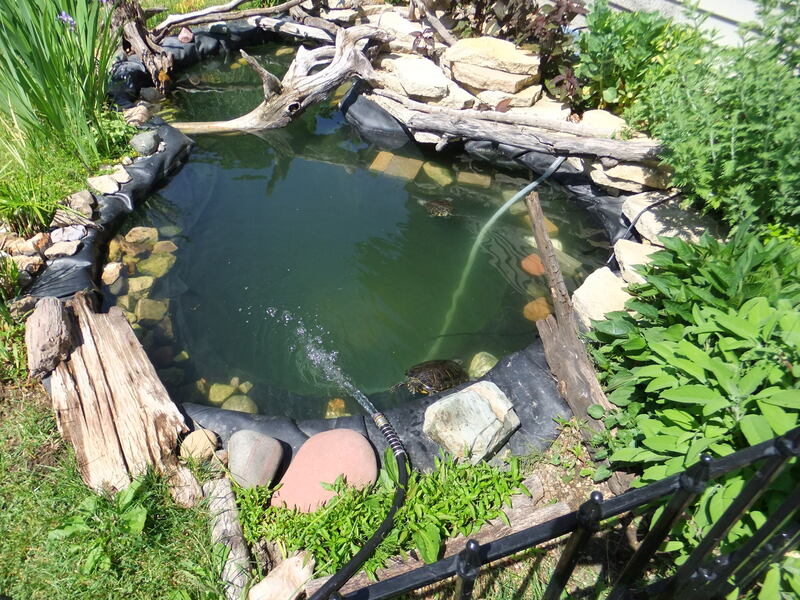 I imagine the big pond filled with Water Lilies and Water Hyacinth, Parrot’s Feather, and Water Lettuce, but it just won’t work with turtles, and that is the case if you are thinking about a Koi pond. They eat almost all vegetation, they get huge, and take massive filtering systems. 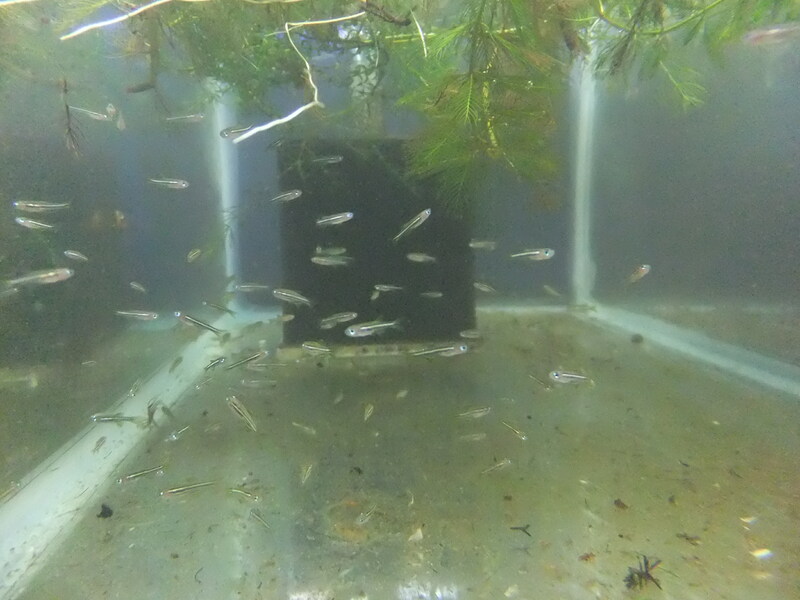 I have some Zebra Danio fry that became free-swimming yesterday so I netted up a bunch and put them into the 30-gallon pond. Before I did that, I swapped out the plastic box filter for a sponge filter. The babies can’t get sucked into a sponge filter. It looks like I netted about 50 babies but there are 30 more in the 10 gallon tank. I’ll do this again tomorrow, and the next day, until I get them all. If I was smart I would take the 10 gallon tank outside and dump the whole thing in. It was hot day, in the high 80’s F, and the pond is right at 80F, perfect for the little Zebras. 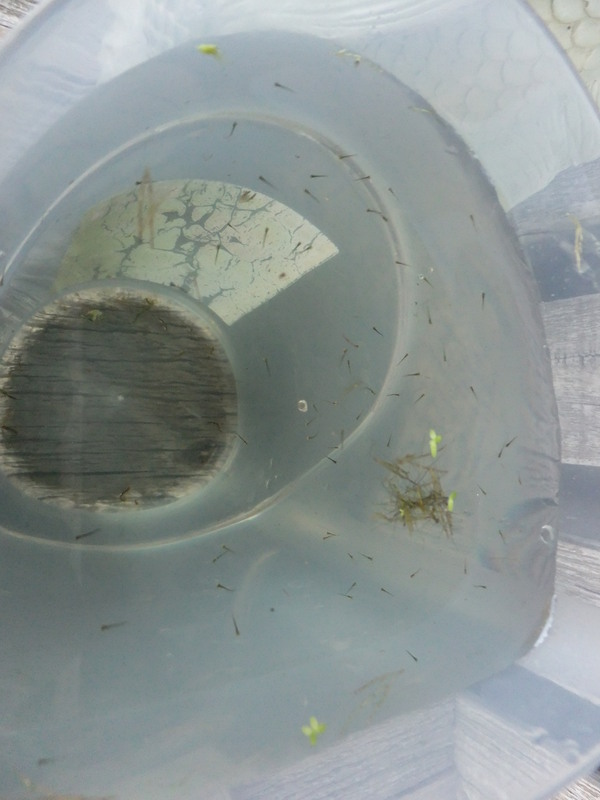 The plastic container with the Zebra babies is floating in the pond, allowing the temperature to get to 80F. 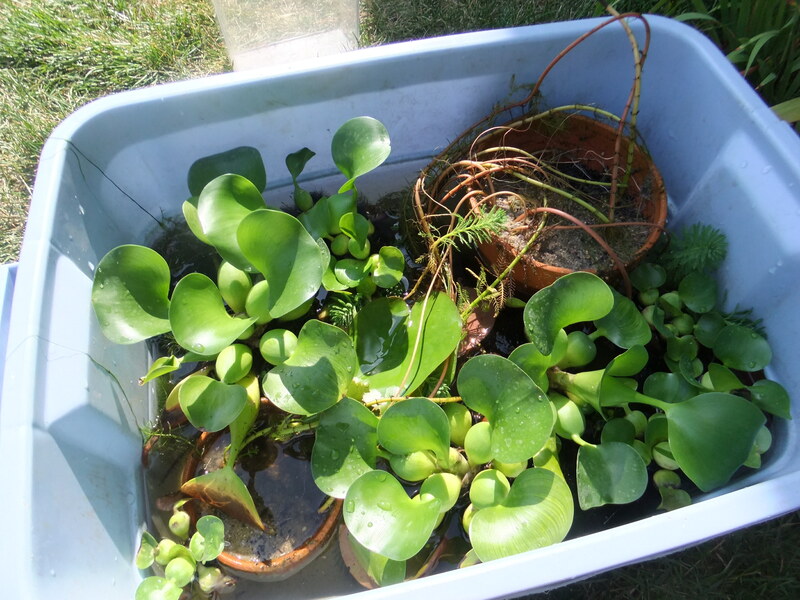 Then I dipped some water from the pond into the container so they get used to the different water quality. 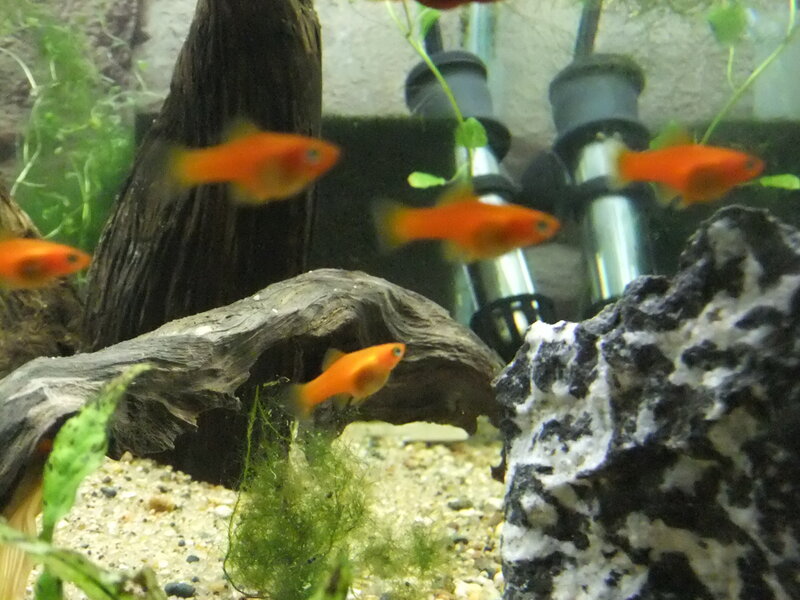 Quickly now, I plan to spawn some Black-Skirt Tetras and add the fry to the little pond also. As soon as I get all of the baby Zebra’s outside I’ll set up the 10 gallon tank for the Tetras. I’ve got some Zebra Danio eggs that are hatching. My plan is to wait a few days, until they are free swimming , then transfer them slowly into my 30 gallon pond and forget about them for a month. 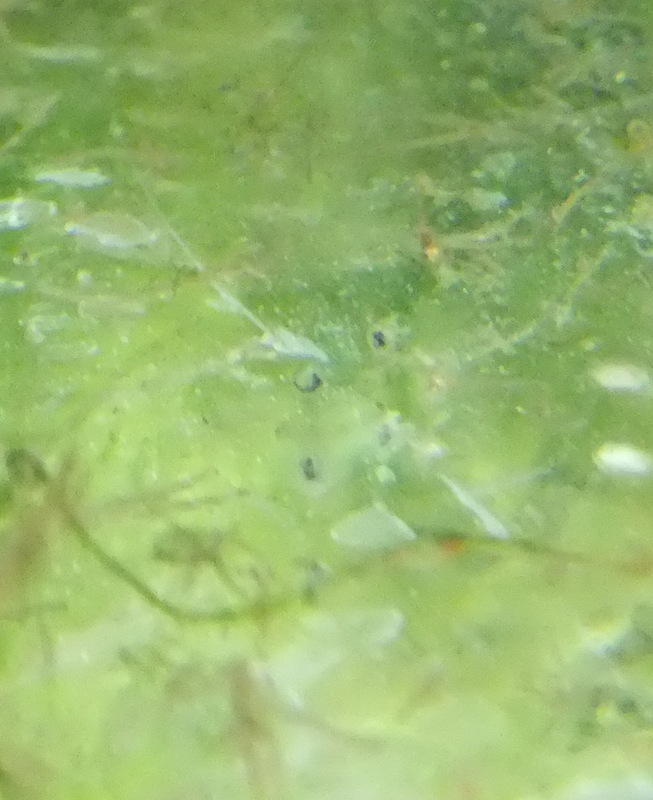 Look closely at this photo to see a Zebra Danio still in the egg but curved into a little “C” shape. 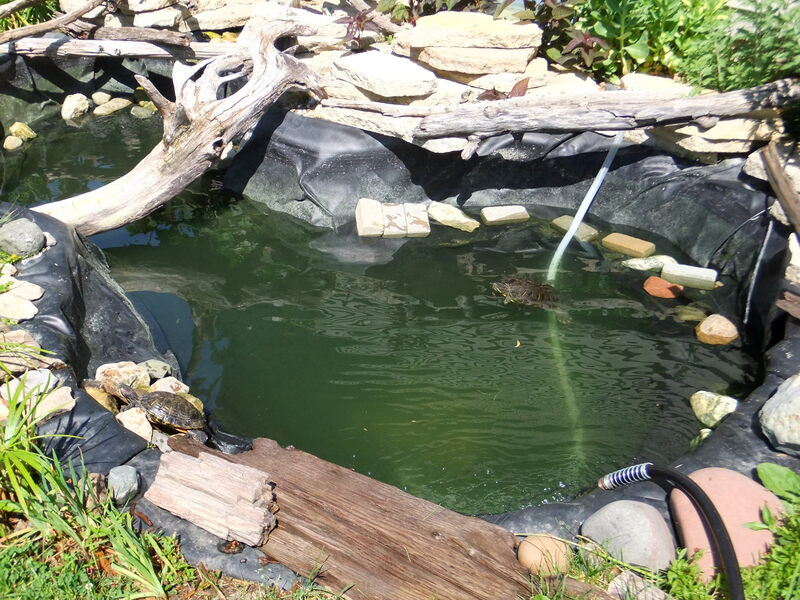 Last week I put some Silver Mollies and Endler’s Livebearers into the turtle pond. Not for food, the turtles are too lazy to chase them. 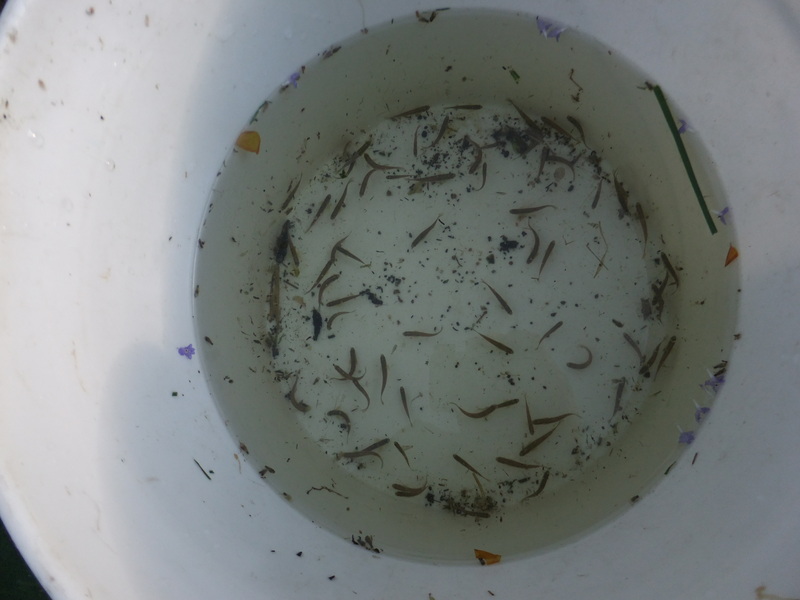 We had a little cold snap, nights in the upper 40’s F, but I can see a number of baby fish in the pond now. 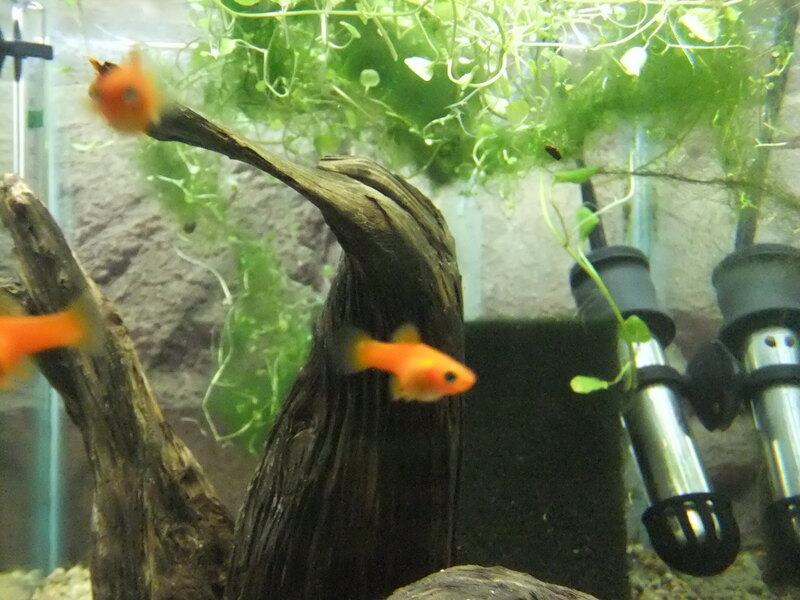 Not sure if they are Endler’s or Mollies. Well, duh, must be both. 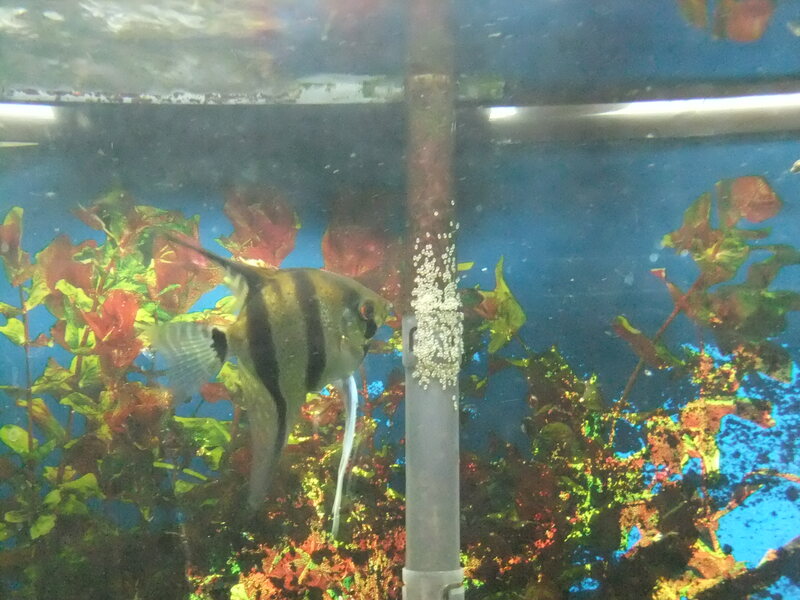 Also, right now, my Silver Angelfish have spawned, again, on the filter intake in the 55 gallon aquarium. So I am puzzling over this. Should I try to save this batch? I LOVE Silver Angelfish. 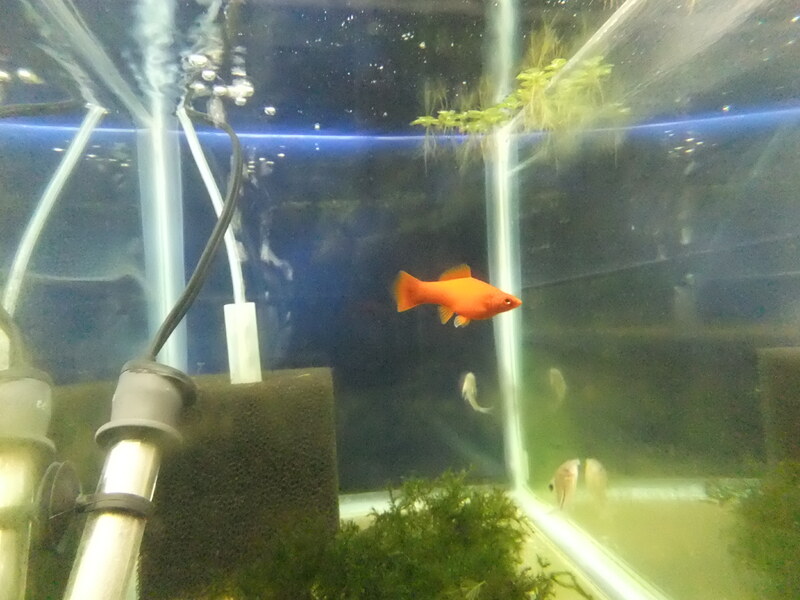 And in a 10 gallon tank my female Red Swordtail is filling up with babies. 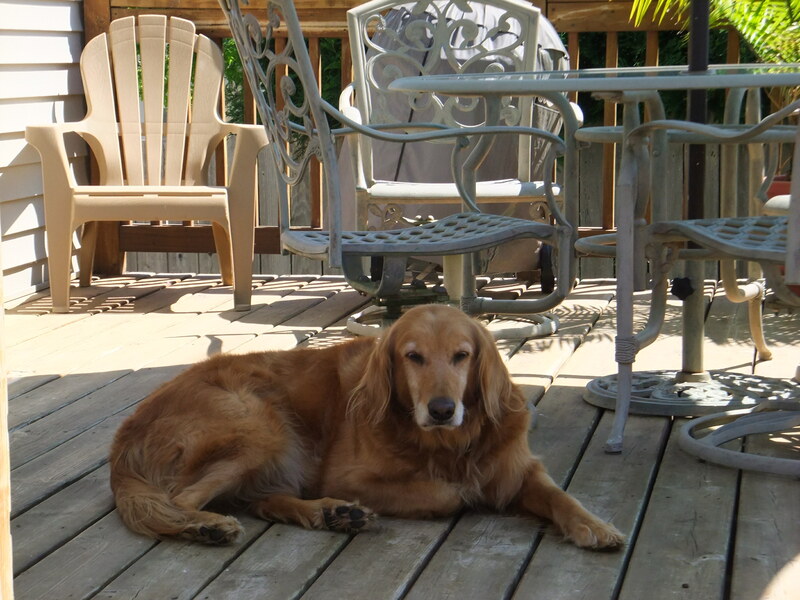 I think I missed her last birthing. I need to toss in a handful of hornwort (floating plant) for the babies to hide in. The five babies from her first pregnancy are doing great, getting fat and turning nicely red, although they look orange in my photos. Note how perfectly I focused on the rock. Note how perfectly I focused on the wood. And what have we all been waiting for? Yes, it’s turtle time again. 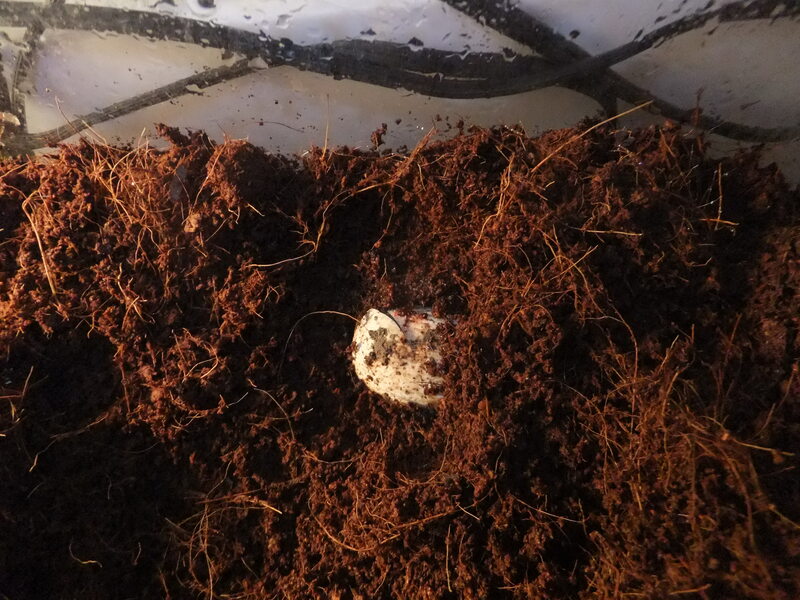 Turtle baby Number Two has hatched. He is still sitting in the eggshell. 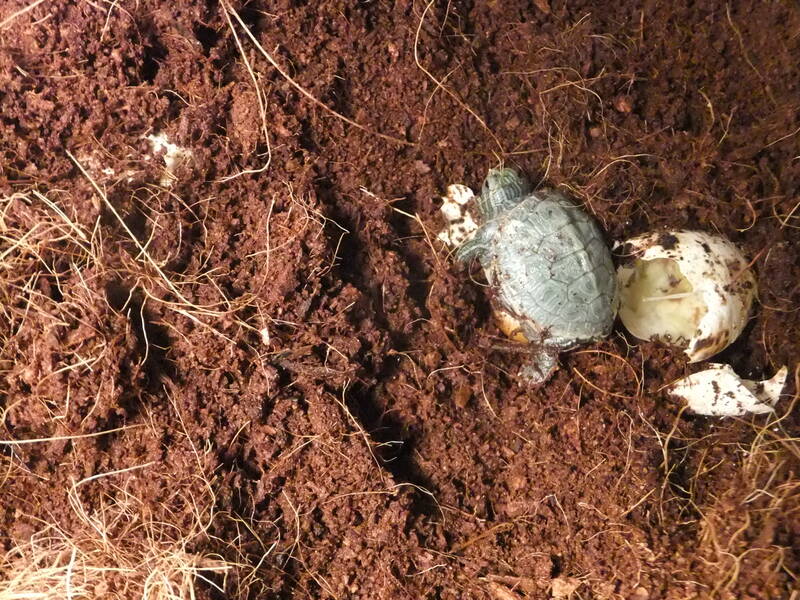 #2 turtle baby breaking out. The first baby still has the yolk sac attached to his belly, but he is crawling around a bit. #1 baby, born Friday night, with egg yolk sac attached. I had a tankful of baby Zebras Danios. I had a tankful of baby Firemouth Cichlids. 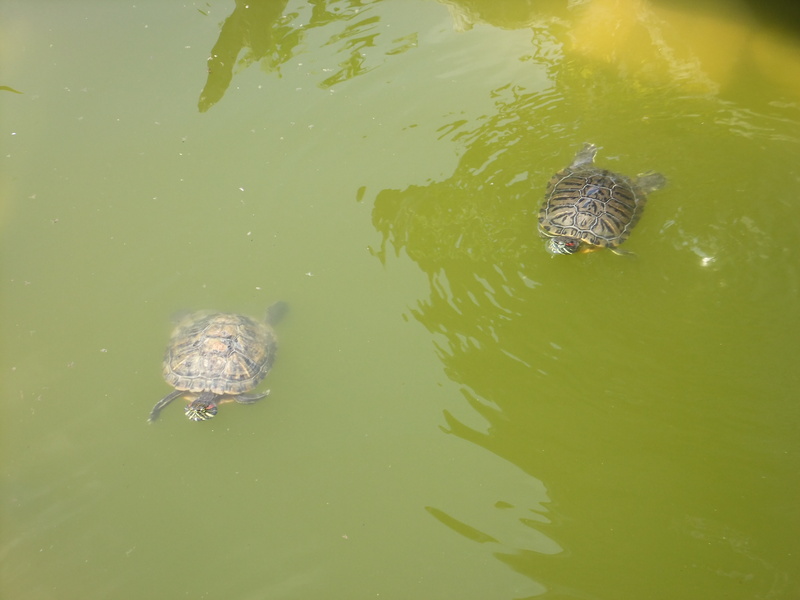 I had a turtle pond with bright green water. 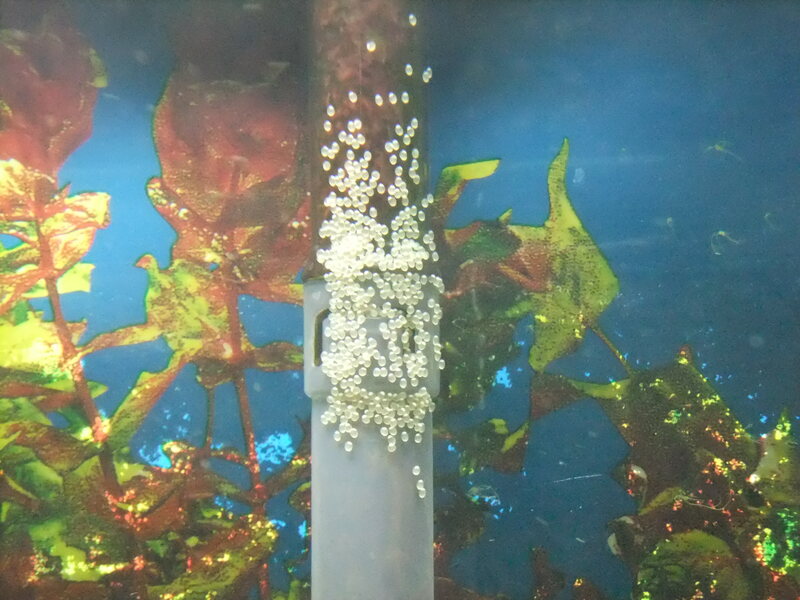 In previous posts I mentioned how useful green water can be for raising baby fish. 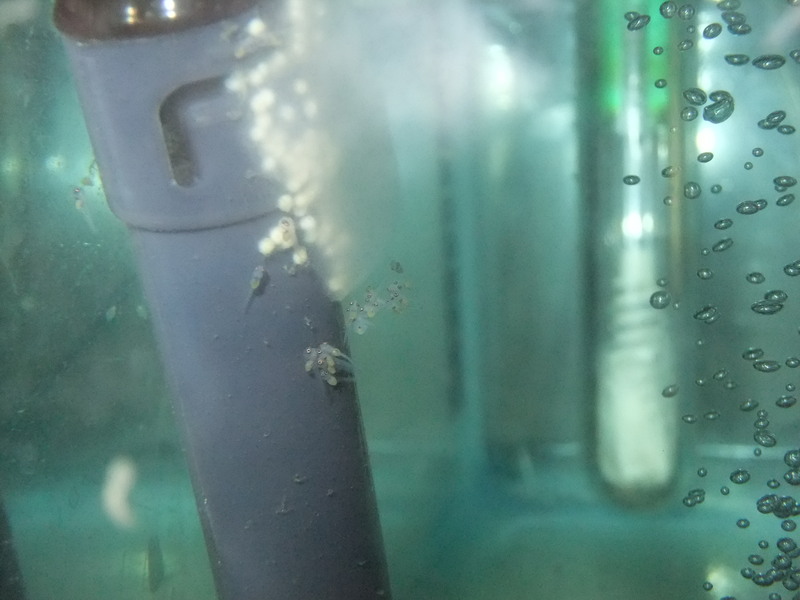 It’s full of algae and micro-organisms that baby fish, especially egg-layers, can eat. I have great success putting baby fish directly into a little outdoor pond and letting Mother Nature raise them. 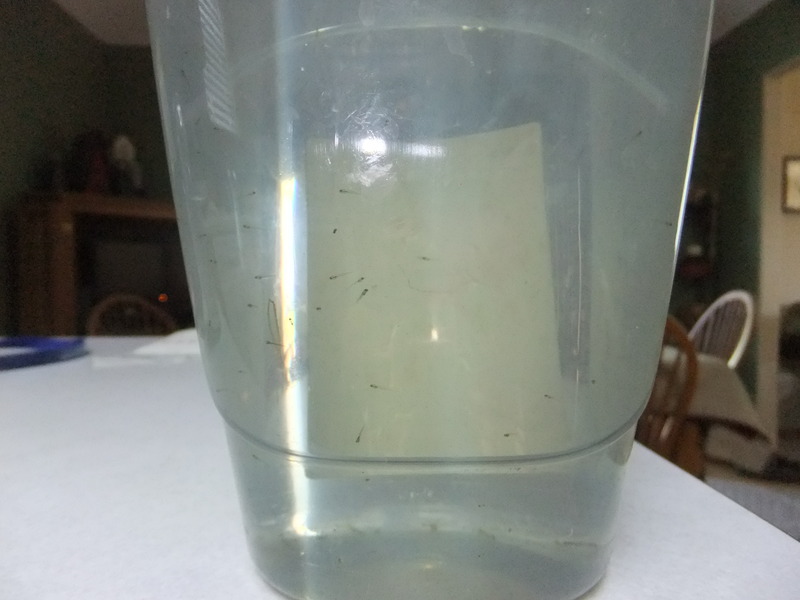 It’s been too cold to put my baby fish into the little 30-gallon pond, and besides, there were hundreds of toad tadpoles in there, so when the baby fish became free-swimming I began to bring in pond water and add it to their aquariums. Here is the critical moment. One day I saw a sick Rosy Red Minnow (in the turtle pond, where I get the green water). The minnow was having difficulty and appeared to be dying. Not an unusual sight in a pond inhabited by fish-eating turtles,but my turtles don’t hunt them too aggressively. I believed there were about 40 minnows living in the pond. Days later, I saw ANOTHER sick minnow, so I grabbed a net and captured a few of the others. They all looked TERRIBLE. Ragged fins, cloudy eyes. Diseased. Fin Rot. High bacterial levels in the water. Polluted, basically. Meanwhile, the baby fishes were all dying quickly and I knew that I had been pouring in this toxic water. I decided NOT to treat the baby fish, I didn’t think they could take any medication. I did some 50% water changes but they were almost all dead at that point. I still had to deal with the pond. 600 gallons of toxic green water. And why was it so? I believe it was the bird droppings. Our neighborhood didn’t have many birds but as the trees have grown larger and people, like me, feed the birds, there are more birds around the pond than in years past. In particular, there are a lot of Sparrows, Grackles, and Mourning Doves. I never worried about it, I thought they were enjoying the little stream. Every blog needs a picture of bird droppings. 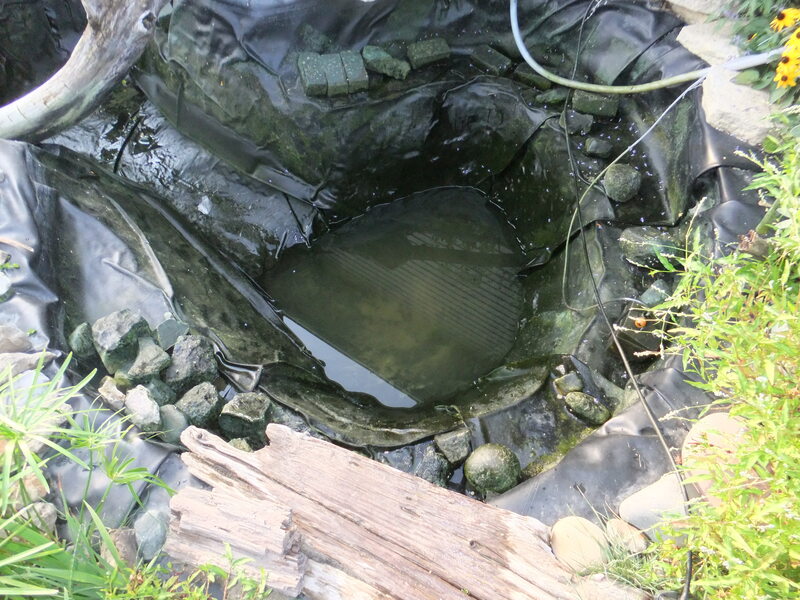 The pond needed to be drained, the filter cleaned, and something done about the pollution. Either keep out the birds, or improve filtration, or both. As I drained the pond I wondered how many minnows were still alive, and what about my 29-cent Goldfish that was about 8 inches long? Poor thing. 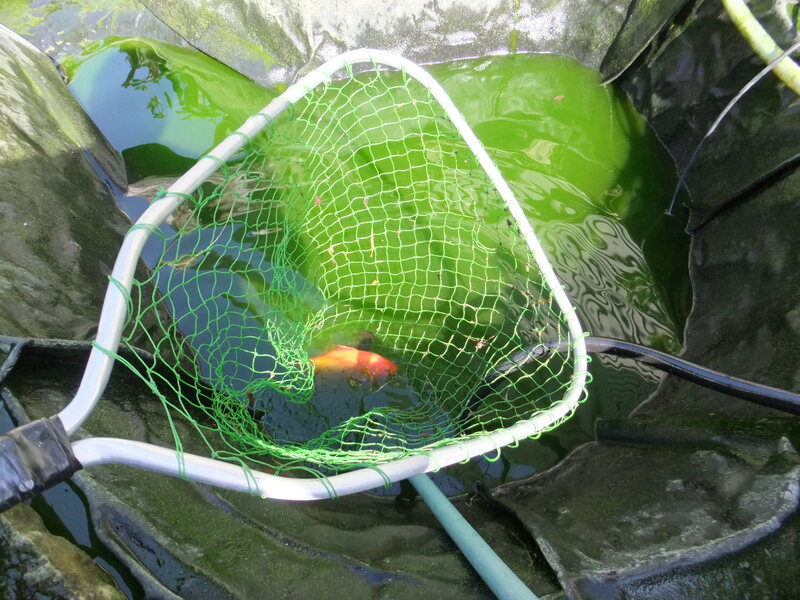 To my shock, no minnows were still alive, NONE, but the Goldfish was. 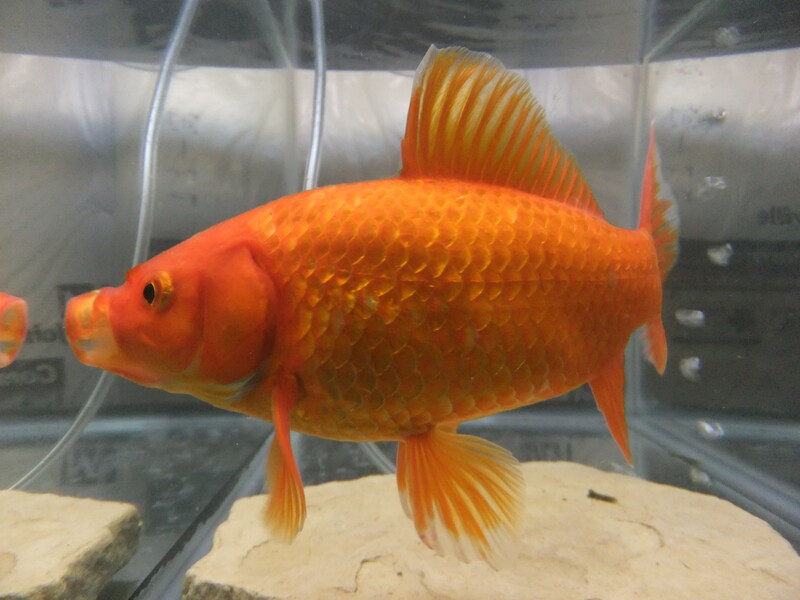 The Goldfish went into a 10-gallon tank. Too small, but clean. The turtles got their shells scrubbed. I hated to drain the whole thing but the water was well-used on my lawn and trees. 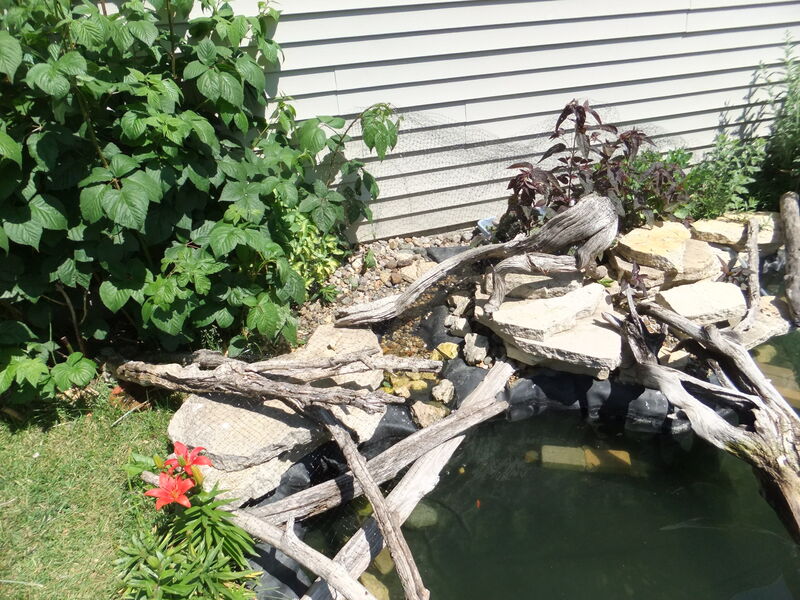 The cost to fill my pond, 600 gallons of water, is TWO dollars and 20 cents. That includes the “sewer fee” that is mandatory, even though it didn’t go to the sewer. One of my sons was very helpful that day. 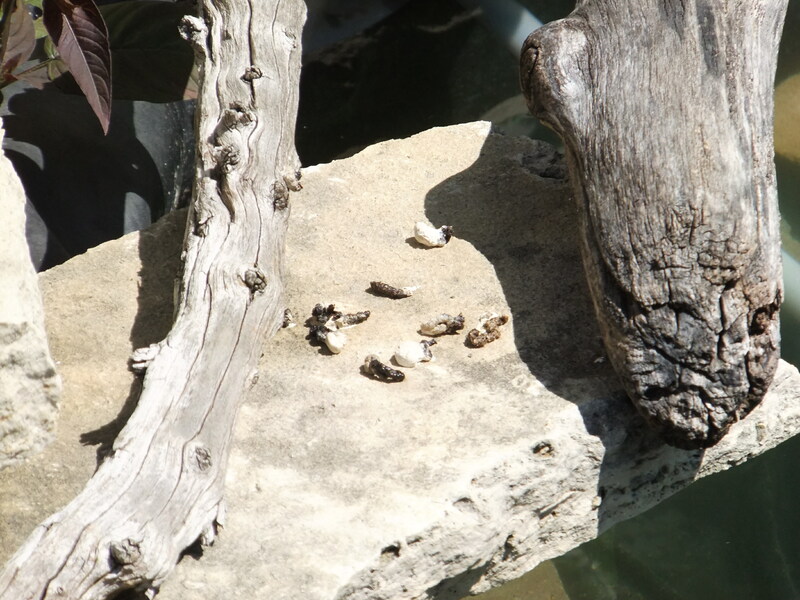 It’s a big job to clean a pond, plus scrub turtle shells. My dog enjoyed the view. I got some plastic mesh that is used for covering fruit trees. I threw it over the filter, stream and rocks, in hopes of discouraging the birds. 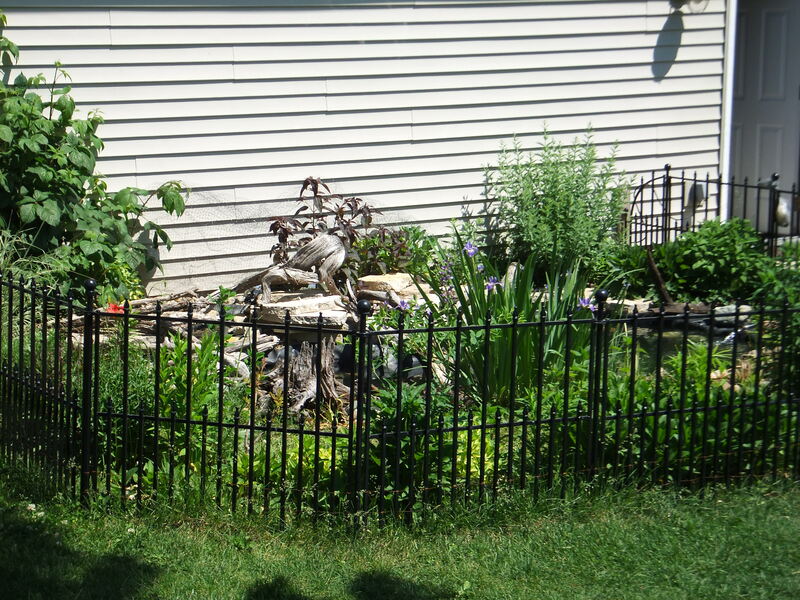 I also have two bird baths in the yard that I hope will keep them happy. Plastic mesh over the stream area. I couldn’t put the mesh completely down to ground level. If the turtles were to walk into it they would get tangled, maybe injured, and if they dragged themselves into the water they might even drown, so I was cautious how I placed the netting. Within half-an-hour I saw several birds darting UNDER the net to get a drink. Nooooo! Are you kidding me! They have no fear! It has been a few days now, the pond looks wonderful, there are FEWER birds, maybe they decided it wasn’t worth the hassle. I still intend to improve the filtration and also investigate bird repellants. Not chemicals, but like a scarecrow. A plastic Owl or Snake. I don’t know if that will help. Maybe a REAL snake! That will fix them. Just think, over 100 fish are dead. Nothing expensive, but it still bugs me. It was very disheartening, and that wasn’t all the bad news of the past week or two. I don’t want to tell you ALL the bad things that have happened. I’ll write a more cheerful post soon and THEN get back to the depressing stuff.